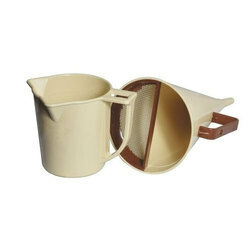 Our range of products include marsh funnel and mud balance testing equipment. Marsh funnel is a simple device for measuring viscosity by observing the time it takes a known volume of liquid to flow from a cone through a short tube. 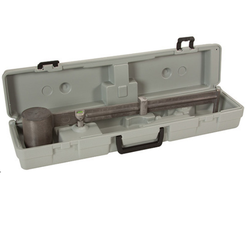 It is standardized for use by mud engineers to check the quality of drilling mud. In use, the funnel is held vertically with the end of the tube closed by a finger. The liquid to be measured is poured through the mesh to remove any particles which might block the tube. When the fluid level reaches the mesh, the amount inside is equal to the rated volume. To take the measurement, the finger is released as a stopclock is started, and the liquid is allowed to run into a measuring container. The time in seconds is recorded as a measure of the viscosity. The Mud Balance provides a simple, practical method for accurate determination of fluid density. Looking for Mud Balance Testing Equipment ?